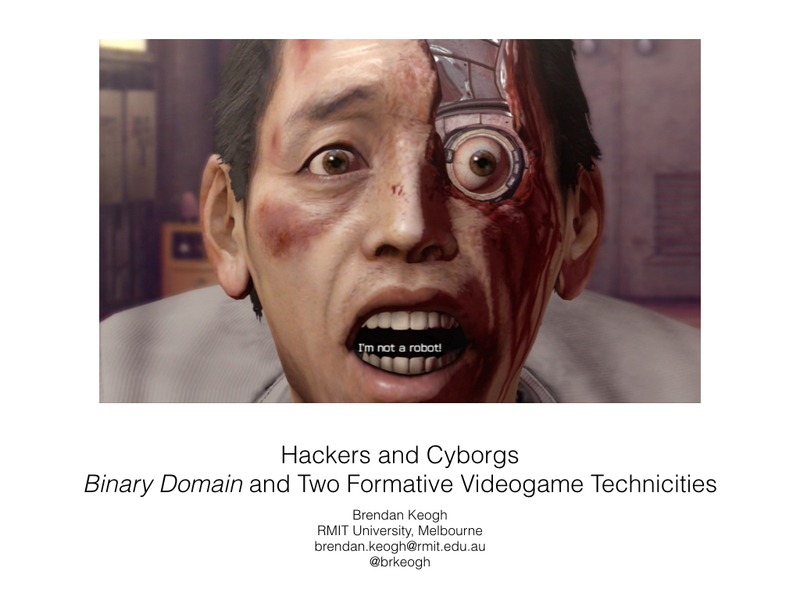 (Last week I attended and presented a paper at the DiGRA (Digital Games Research Association) 2015 conference at Leuphana University in Lüneburg, Germany. It was a really great, welcoming conference that I’m really glad I was able to attend. I was only able to attend because a whole lot of people were gracious enough to help fund me through a GoFundMe page. Because of this, I wanted to make my research as open and accessible as possible. Academia is already inaccessible enough through (often necessary) jargon and (only ever exploitative) paywalls, so to have my research essentially funded by a public readership and not be publicly available would’ve made me real uncomfortable. So you can download and read the full paper I presented here. Further, here is an edited transcription of my talk from the actual conference, interspersed with my slides. Personally, I think reading the actual paper will provide a more thorough version of my argument, as I am a much better writer than speaker, but the transcript here is probably more accessible and digestible. You can also just listen to the audio here if you wish. The Q&A at the end is included in the audio but not in this transcript. You can’t hear the questions too well, but you can hear my answers. Hello. My name is Brendan Keogh. I’m a PhD student from Melbourne in Australia. My paper is going to be quite different from the other two in terms of approach. I don’t have numbers or empirical research or anything. It’s more just kind of an idea. I wouldn’t even call it a model; I think that would be too generous. This presentation is a side interest to my PhD research. I have this ongoing bugbear about presumptions we have both in popular non-academic game culture and in academic game discourses. I feel like we make a lot of presumptions about what values a videogame should have, and we don’t really question those. A videogame has to have a winning condition, for instance. We don’t stop to think why we think that. So then when a videogame doesn’t have a winning condition, we don’t know what to do about it. So this has been a bugbear of mine for a long time, and I’ve found a lot of the cyborg theory from the 90s and 80s really useful in countering and unpacking this stuff. And then I played this Japanese game called Binary Domain and I’m like, wow, this really silly Japanese shooter is dealing with all these themes of cyborgism that I’ve been trying to talk about. So in this paper I’m setting up this metaphor, which is a false binary really, and I want to both be explicit about this and not overstate its usefulness.